What Else Can I Expect From an Online Bachelor's in Marketing Program? Marketing is a subdivision of business that explores various methods and strategies for generating public interest in goods, services, organizations, and other valuable commodities. The profession is heavily entrenched in research; marketers must analyze sales data, customer reviews, economic trends, and other factors that affect consumer activity. Many marketers specialize in specific areas of the industry, such as public relations, brand management, web marketing, and social media. Most careers in marketing are attainable with a bachelor's degree. Some colleges and universities offer degree programs dedicated to marketing, while others allow business majors to concentrate their studies in marketing courses. Many of today's students are choosing to earn their bachelor's in marketing online, rather than in a traditional classroom-based program. Web-based students must complete the same rigorous curriculum as their brick-and-mortar counterparts, and they enjoy an equal number of job opportunities once they have successfully graduated. The asynchronous (or self-paced) online format is also ideal for students who must balance their coursework with other commitments, such as part-time employment or childcare responsibilities. Internships are usually not required in marketing bachelor's degree programs, but these opportunities are widely available for students who wish to gain real-world experience before entering the workforce. Learn more about what you can do with a bachelor's degree in marketing and what kind of career opportunities you can look forward to with this comprehensive guide. HOW MUCH DOES A MARKETING DEGREE ONLINE COST? An online bachelor's in marketing tuition will vary between institutions. For more accurate information, students should contact their prospective schools. Read more here..
After being admitted, students must complete all curriculum requirements, which may include an internship or capstone project. For more accurate information, students should contact their prospective schools. Read more here..
WHAT CAN YOU DO WITH A BACHELOR'S DEGREE IN MARKETING? Bachelor's in marketing graduates are prepared for careers as marketing managers, market research analysts, marketing specialists, marketing coordinators, and more. The marketing curriculum prepares them for a broad range of careers. Read more here..
WHAT TYPE OF BACHELOR'S DEGREE IS MARKETING? Marketing is considered a type of business degree. Students will learn how to conduct market research, analyze data and market trends, and generate public interest in goods. Read more here..
A bachelor's degree in marketing covers methods and strategies for generating public interest in goods, services, organizations, and other commodities. Students learn how to use maret data to predict economic trends. Read more here..
WILL AN ONLINE BACHELOR'S IN MARKETING PROGRAM PROVIDE ME WITH THE SKILLS I NEED TO ADVANCE MY CAREER? Students graduate from marketing bachelor's degree programs with an extensive skill and knowledge set. Many courses require them to collaborate with fellow students and create mock advertising campaigns designed to mirror real-world projects. They will also become familiar with sales databases, web-based media and other tools commonly used in the industry. WILL AN ONLINE BACHELOR'S IN MARKETING WORK WITH MY SCHEDULE? Online bachelor's programs offer a flexible alternative to traditional, campus-based higher education. Students can access lectures and course readings, submit written assignments, complete exams, collaborate with classmates on group projects, and communicate with faculty members on their own schedule. Current technology also allows them to study away from their home computer using a laptop, tablet, smartphone and other devices with Wi-Fi capabilities. For added convenience, online students can usually coordinate internships at sites near their current residence. WHAT JOBS CAN I GET WITH MY BACHELOR'S IN MARKETING? Job candidates with an online bachelor's in marketing will be qualified for most entry-level jobs in the industry. Students who earn a major or degree concentration may also be eligible for specialized roles in niche areas of marketing, such as market research, social media, or direct marketing. Popular careers for degree-holders in this field include: advertising, promotions and marketing managers; research analysts; sales managers; and advertising sales agents. Marketing jobs are widely available at large companies and organizations, as well as private advertising and design firms. WHAT ARE THE BEST ONLINE BACHELOR'S IN MARKETING PROGRAMS? Choosing a program is an incredibly personal decision, and only you can properly evaluate whether a target school's strengths match your educational needs. 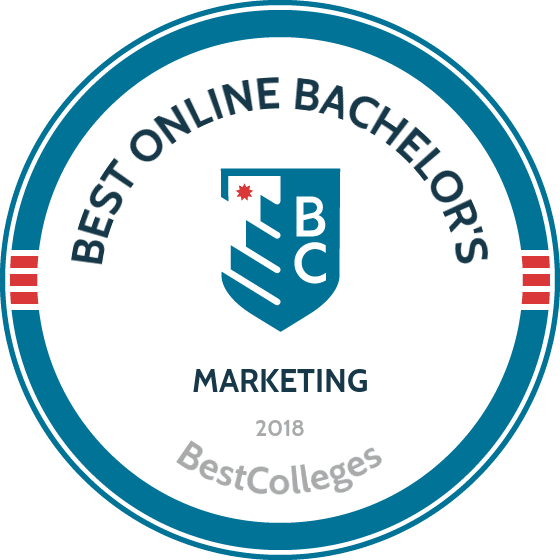 The following ranked list of schools should serve as a helpful starting point in your search for the best online bachelor's in marketing programs in the United States. If you are considering an online bachelor's in marketing, be sure to contact admissions specialists at different colleges and universities to learn more about their about specific bachelor's degree requirements and offerings. As Miami’s largest university, FIU serves 50,000 students. The university has offered online learning since 1998 and currently delivers 27 fully online programs, including a bachelor's of business administration with a concentration in marketing. The curriculum prepares students for work in high-demand fields, such as public relations, communications, online marketing, retail, market research, and advertising. FIU's 120-credit hour, online marketing program helps distance learners understand fundamental marketing principles and strategies through studies of central concepts in sales, research, and consumer behavior. In addition to general education courses, students must complete 21 credit hours in pre-core courses like macroeconomics and microeconomics, 27 credit hours in business core courses like financial management and the business legal environment, 21 credit hours in major courses like consumer behavior and personal selling, and 12 credit hours in business electives. The university matches each distance learner with a success coach who can help them improve their study habits and hone their time management skills to successfully balance school, work, and personal life. Additionally, academic coaches with expertise in marketing facilitate content delivery and ensure that students optimize their online learning experience. Marketing degree candidates can seek membership in FIU’s chapter of the American Marketing Association. Online learners can avoid many of the fees on-campus students pay, although they won’t have access to on-campus resources like computer labs, sports events, recreational facilities, and parking. FIU offers its online marketing programs three times each year — fall, spring, and summer. Admission requirements include a minimum 2.5 GPA, SAT, or ACT scores, and high school transcripts in addition to a $30 application fee. Transfer students who complete their associate degree at certain area colleges participating in the Connect4Success program can count on admission to FIU Online for the remaining two years necessary to complete their bachelor's degree. Located in Gainesville, the University of Florida offers over 500 remote courses and a number of degree programs, including an online bachelor of science in public relations. Facilitated through UF’s award-winning College of Journalism and Communications, this program develops the research, writing, marketing law, and visual design skills to succeed in the field. Many graduates pursue their master’s degree or occupy positions as social media specialists, technical writers, account coordinators, and other lucrative careers. Students can take all 124 credits of the degree via asynchronous coursework. Classes include audience analytics, law of mass communications, and international public relations. The curriculum also contains 13 hours of guided professional electives where students can personalize their education. Additionally, degree candidates may pursue an optional certificate in international communications to further bolster their job prospects. UF Online is dedicated to helping students develop professionally, and distance learners can build relationships in one or more of the Gator Clubs or access the Career Resources Center, which provides assistance with resume building and even job placement through the university’s business partnerships. UF is often regarded as one of the most affordable schools in the U.S. and the online marketing degree is no exception. The tuition rate is set at an exceptionally low per-credit price for all distance learners (75% less than traditional students) and financial aid, including awards for transfers and military personnel, is available. Three start dates are offered every year. To apply, prospective students must submit academic credentials with a minimum 2.0 GPA (2.5 for transfer candidates based on program criteria) and standardized test scores: at least 19 for the ACT and 1340 for the SAT. Those with 60 or more transferable credits do not need to send test scores. Founded in 1851, the University of Minnesota is a leading research institution in the U.S. Considered a “Public Ivy,” UM enrolls nearly 31,000 undergraduate students every year, many of whom take classes and earn degrees remotely. Among the distance education options is an online bachelor of science in marketing, a 120 credit program in which students learn to assess consumer needs in an ever-changing global market. Degree candidates also develop fundamental administrative and visual communication skills necessary to succeed in all areas of business. Students can earn their B.S. entirely online, taking major coursework in topics such as financial accounting, management information systems, and integrated marketing communications. The degree plan also contains an internship requirement, which students fulfill the summer of their third year. Opportunities abound in the Twin Cities area, or students may complete the internship where they live. UM online students enjoy individual support, as well: mentors are available to help with course planning, research opportunities, and other forms of professional development, including career placement. Ninety-three percent of graduates obtain jobs within six months of earning their degree, in positions such as copywriting, market research analysis, event planning, and other related fields. According to the U.S. Bureau of Labor Statistics, careers in the marketing field are expected to grow 14% through 2020. Students may enter this marketing degree online program at two points during the year, August and January. Application materials include a high school diploma or equivalent with a minimum 2.0 GPA. Candidates must also score at least a 21 on the ACT or 980 on the SAT. The same affordable tuition rate is offered to all distance learners and financial assistance is available, including scholarships specifically for online and adult students. Additionally, UM participates in the national Workforce Innovation and Opportunity Act, which helps underemployed/unemployed citizens pay for career training and degree work. Penn State World Campus serves nearly 18,000 distance learners enrolled in more than 125 programs. Known for its academically rigorous degrees, the school has offered distance education since 1892. The 120-credit bachelor's of science in marketing features doctoral faculty who boast extensive corporate marketing experience. Required courses cover a variety of topics, including effective business writing, corporation finance, and supply chain management. Optional courses include marketing techniques for electronic commerce and business-to-business marketing. Additionally, the program's capstone project requires degree candidates to design an integrated strategic marketing plan. An asynchronous format, ideal for working professionals, gives distance learners the flexibility to combine self-study with peer interaction. However, students must meet due dates for exams and class assignments. Fully online courses use the Blackboard Learning Management System (LMS), Skype, video conferencing, social media, phone calls, email, and bulletin boards to keep online learners engaged and to encourage personal networking. Most courses last for 12-15 weeks, and degree candidates typically devote 8-12 hours per week to assignments for each course. Penn State assigns newly admitted students an academic adviser who helps them develop a personalized study plan, use the online bookstore, and take advantage of various resources like exam proctoring, tech support, and online tutoring. Additionally, distance learners can join the World Campus chapter of the Blue & White Society, a student and alumni group that affords numerous networking opportunities. Students can connect with classmates through Facebook, Twitter, YouTube, and Flickr. Graduates of Penn State's online marketing degree attend the same commencement ceremonies as their on-campus counterparts. Online marketing degrees typically require at least a minimum 2.0 GPA and specific prerequisite coursework. Penn State waives its application fee for military members and veterans (and their spouses). In addition, the school offers military student support and financial programs like Military Grant-in-Aid, which can lower tuition costs for marketing degrees online by as much as 44%. At WGU in Salt Lake City, students enrolled in the innovative bachelor's of science in marketing management program earn their degree by demonstrating knowledge gained, not by showing up for a class. Distance learners exhibit concepts and skills they’ve learned through periodic assessments in the form of projects, assignments, and tests. Although degree candidates can choose how quickly they move through the curriculum, they must take required courses in a prescribed order. In this way, students earn competency units equivalent to traditional credit hours. Distance learners meet regularly with assigned student mentors throughout the program to establish study goals, evaluate their progress, and resolve academic concerns. The curriculum consists of 120 competency units. Students with an associate degree can complete the program within two years, while those with no prior college history typically do so within four to five years. WGU does accept a limited number of transfer credits earned at accredited institutions. The online marketing program covers product management, strategic marketing, pricing, promotion, sales, and distribution. Sample courses include organizational behavior, business ethics, spreadsheets, and change management. To graduate with one of the best online marketing degrees available, candidates must complete a capstone project that requires them to apply their newly acquired knowledge to a real-world issue. Each WGU term lasts for six months. Students with a full course load of 12 competency units per term spend about 20 hours a week on their coursework, which includes live cohort and webinar sessions, one-on-one discussions, and chats. As an online university, WGU's affordable tuition rates have remained unchanged since 2008. Students pay a flat tuition rate each six-month term, so those who are motivated to accelerate their online marketing degree program by taking a heavier course load will pay less for their degree overall. Applicants without an associate degree must complete WGU's Readiness Assessment prior to enrolling in the program. Located in New York City, the Fashion Institute of Technology belongs to the State University of New York (SUNY) network. FIT is regionally accredited and provides a variety of remote degree programs, including an online bachelor of science in international trade and marketing for the fashion industries. In an ever-changing global marketplace, the strategies and inspirations that surround the making and selling of clothing and other fashion items must shift as industry aesthetics and consumer needs change. FIT students not only learn business and design fundamentals, but how to appeal to buyers through sustainability initiatives and multicultural understanding. All courses can be completed online asynchronously through Blackboard, and classes include topics like global sourcing, international business transactions, and mathematical modeling for business applications. As its name suggests, the FIT program offers specific focus on the international fashion industry, and students personalize much of their major coursework through guided electives. With the help of a faculty advisor, students also select advanced classes that best suit their interests and career goals. Degree candidates also complete an internship or similar practicum experience, picking from one of FIT’s many business partnerships in the NYC area or pursuing experiential learning in their own communities. In addition to the work they do as part of their degree requirements, distance learners also may take on independent research, community service, or membership in organizations like the Presidential Scholars Program. The FIT program is designed as a degree completion track and candidates must either hold an associate’s degree or at least 60 transferable college credits to be eligible for the program. Potential students must also submit standardized test scores, a personal statement, and a portfolio guided by departmental criteria. FIT bases its affordable tuition rates on the student’s residency status. Colorado State University established its distance education platform in 2007; today CSU enrolls over 10,000 students annually in its vast catalog of remote classes and fully-accredited degree programs. Among the options is an online bachelor of science in marketing, where students assess and predict consumer behavior to create effective advertising campaigns and conduct valuable market research, to then drive decision making in companies and organizations all over the world. Graduates occupy roles as professional marketers, public relations specialists, sales managers, and more. All degree requirements can be fulfilled remotely through asynchronous course design by Schoology, and most online students earn their B.S. in four years or fewer. Totalling 120 credits, the degree plan includes courses like digital marketing, applying leadership principles, and product and brand management. Students also complete a capstone seminar and practicum; the former sees them working cooperatively to solve pertinent challenges in the field, while the latter involves hands-on skill development in a real work environment under the guidance of a project coordinator. Additionally, the CSU Online pathway is customizable to a student’s career or personal goals; a long list of specializations is available, such as computer programming, healthcare management, and small business and entrepreneurship. CSU Online offers a flat per-credit tuition rate to all distance learners. The university also guarantees that, as long as students remain in good academic standing, their tuition prices will not increase. Additionally, online students may access financial assistance, including scholarships specifically for those with high academic performance and those pursuing a degree completion track. Though CSU welcomes all applicants, those with at least 12 transferable college credits (and up to 90) at a minimum 2.3 GPA are preferred. For over 150 years, Oregon State University has provided accessible and career-centered higher education. The school’s Ecampus continues this mission with nearly 50 undergraduate and graduate degrees available fully online, as well as over 1,000 course offerings. The online business administration features numerous options for students to tailor their education to their personal and professional interests. This online marketing degree can be conferred as either bachelor of arts or a bachelor of science, while five specializations are available including digital marketing specialization and supply chain and logistics management. Regardless of the path, OSU emphasizes entrepreneurship and experiential learning that builds on a student’s prior professional experiences. OSU graduates have gone on to successful careers as market researchers, marketing campaign managers, and financial analysts. The degree plan totals 180 quarter credits (equivalent to 120 conventional credits) and consists of core classes like operations management and business information systems. Students then take advanced coursework in their specialization, with topics that range from retail management to digital media and marketing integration. The curriculum also includes a large number of electives, which degree candidates can use to focus their major or pursue study in another complimentary area. The marketing bachelor's degree online program at OSU can be completed entirely online or through a hybrid experience, with students blending flexible night and weekend classes at the flagship Corvallis campus, or in the newly-built education centers in Portland. Distance learners also enjoy personalized advising as well as professional development and job placement assistance through the Career Success Center. Three start dates are offered every year and the low online tuition rate is the same for all distance learners. To apply, candidates must furnish academic credentials with a minimum 3.0 GPA for first-year students and 2.25 to 2.5 for transfers depending on how many applicable credits they hold (up to 75). New students must also submit standardized test scores, either ACT or the new SAT. One of three schools in the state’s public higher education system, the University of Alabama at Birmingham is a top-tier research and academic institution that enrolls over 20,000 students annually. UAB offers a wide range of degree programs to traditional and distance learners, including an online bachelor of science in marketing. Students in the program develop innovative campaign strategies that motivate consumers and grow companies, while also learning the multinational business strategies and ecommerce practices crucial to all sectors of the field. Graduates of the program have found careers as sales professionals, public relations specialists, and fundraising managers. The 120 credit curriculum is delivered fully online via the Canvas learning platform, while asynchronous coursework accommodates the busy schedules of working professionals. Students take classes in financial management, social media in marketing, and integrated marketing communications, among others. Degree candidates then round out their education with two capstone seminars in sales management and strategic marketing. Both courses include collaborative and project-based learning as students analyze the current trends and challenges in the field and work to provide solutions and improve strategic plans. Distance learners also have access to advising and online tutoring services. Online tuition is based on the student’s residency status and financial aid is available, including scholarships for transfer and out-of-state learners. Application requirements for this online marketing degree program include a high school or college diploma and standardized test results. Writing scores are not required. Though UAB doesn’t have a minimum GPA threshold, it should be noted that the average undergraduate applicant holds a 3.62. Located in Greenville, East Carolina University offers 84 undergraduate degrees and enrolls over 29,000 students annually. Many of these degrees are accessible to distance learners, such as the online bachelor of science in business administration with a concentration in marketing. Designed as a degree completion program, students transfer the first half of their coursework from another school, such as a community college in their local area, and complete their major classes and advanced requirements online through asynchronous classes and hands-on learning experiences. ECU marketing degree students create and implement successful campaigns, from assessing consumer needs and designing ads using the best practices in marketing communications, to planning budgets and leading teams to actualize the project. The 120 credit degree includes major coursework in customer relationship marketing, sales force management, and persuading decision makers. BSBA students must also take a capstone seminar and complete an internship requirement. The ECU College of Business also provides a comprehensive list of services to help distance learners succeed. The Academic Advising Center helps students transfer credits and plan courses, while the Business Communication Center facilitates professional development workshops and faculty-led research initiatives. Finally, the college’s Career Center assists with internship and job acquisition. The BSBA has three start dates throughout the year. Transfer applicants are assessed on the rigor of their college work and their overall performance on a holistic basis. Those with 24 hours of credits or more do not need to submit high school diplomas. ECU bases its affordable tuition rate on residency status. All distance learners have access to financial aid, which includes the need-based university grants and a variety of scholarships for academic achievement and student status. Founded in 1899, Appalachian State University began as a school to train educators to teach underserved populations in the surrounding communities. Today ASU is a fully-accredited institution of learning that provides accessible academic programs to nontraditional and distance learners. Students in the online bachelor of science in communication, advertising develop the research, strategic communication, and project management skills to design campaigns that connect with consumers and build an immersive brand experience. The 122 credit degree consists of major coursework in topics like media publishing, communication research methods, and professional ethics in advertising. Additionally, students must complete a minor in an area like general business administration or graphic design. The curriculum culminates with an experiential learning capstone seminar, where students explore contemporary challenges in the marketing field and provide creative solutions. There is no internship requirement, however ASU strongly recommends degree candidates engage in a practicum. Students can also facilitate professional development by joining the ASU Advertising Club, which hosts networking events, guest speakers, and other formative opportunities. ASU designed its online marketing bachelor's degree program as a completion path. To enroll, students must transfer at least 50 credits with a minimum 2.25 GPA from another regionally accredited college or university. Standardized test scores aren’t required. All major coursework can be completed asynchronously online, while most students complete the degree in six semesters. The flexible schedule allows students to work full-time while earning their degree. Tuition is priced based on a student’s residency status and financial aid is available, including scholarships for transfer and online learners. For North Carolina residents, the per-credit cost is among one of the lowest in all the state. Founded in 1964 on an airbase, Florida Atlantic University was the first school in the U.S. to use radio and television broadcast technology to help students learn outside the classroom. This dedication to innovation and accessibility in higher education continues as FAU now offers a number of fully-accredited online academic programs, including a bachelor of business administration in marketing. A comprehensive degree, students at FAU develop skills in financial planning, persuasive communication, and strategic marketing. Many graduates go on to successful careers in lobbying, public relations, imports/exports, and promotions. As a degree completion program, FAU requires students to complete approximately half of general education and lower division major coursework with a minimum 2.5 GPA at another college or university. Transfer guidelines also include foreign language proficiency, adequate interdisciplinary writing skills, and, preferably, an associate’s degree from an regionally accredited Florida institution. Degree candidates then take advanced courses at FAU, which includes topics in promotional management, digital marketing, and principles of advertising. If necessary, students round out the 120 credit curriculum with guided electives. Coursework is asynchronous and delivered via Canvas. Students in FAU’s online bachelor's degree in marketing program enjoy an extensive suite of academic and professional support, such as one-on-one advising and online tutoring through the Math Learning Center and CLASS software, a personal student mentor, and career services. Additionally, students can engage with campus organizations like the Leadership and Service Honor Society to cultivate friendships and professional connections. FAU prices the online tuition rate based on residency status. All students have the opportunity to apply for financial aid, which includes awards like the Presidential Scholarship for first-years and Academic Excellence Grant for non-residents. Arizona State University enrolls more than 20,000 students every year in 40 top-ranking undergraduate and graduate degree programs. Many of these programs reach far beyond the school’s Tempe campus and are accessible to distance learners, including an online bachelor of science in marketing. This online marketing degree focuses on the crucial role market forces play in the survival and success of organizations, and as such, students develop a global perspective on business through project-based assignments and collaboration with peers and faculty. Many graduates find work in areas like professional sales, international marketing, and social media management. The 120 credit degree plan consists major coursework such as consumer behavior, business-to-business marketing strategy, and applied skills in management and leadership. Additionally, degree candidates must complete a capstone seminar in contemporary cases in international marketing where they learn to effectively manage relationships between key stakeholders. Students also may use elective credits to pursue advanced studies in marketing or gain professional experience through faculty-guided research and internship opportunities. Online courses are asynchronous and span an accelerated 7.5 weeks, enabling students to pursue their BSM degree full-time while also working. The marketing bachelor's degree online program at ASU is rigorous and suitable students who are independent, self-motivating, and have proven academic achievements. To apply, candidates must a minimum 3.6 GPA and/or be in the top 8% of their high school class. Standardized test scores are also required and potential students must score at least a 25 on the ACT or a 1230 on the new SAT. ASU welcomes transfer applicants and accepts up to 90 credits from other regionally accredited colleges and universities. All distance learners pay the same affordable tuition rate and financial support is available. A Jesuit Catholic university located in Denver, Regis emphasizes experiential learning in more than 78 online programs that challenge distance learners to think critically, develop innovative solutions for complex challenges, and communicate clearly. The school's digital marketing degree online – a bachelor's of science in marketing – features professional practitioners as faculty who approach marketing in nonprofit, small business, and corporate settings from an ethical perspective. The synthesis of marketing theory with a real-world education ensures that graduates leave the program with a detailed knowledge of current trends and practices in marketing. The university's 128-credit hour program includes 45 credit hours in required core courses (like oral communication skills), 28 credit hours in foundational courses (such as owning your career), 30 credit hours in upper-division requirements (like ethical decision-making in business), an optional minor, and general electives. All online students pay the same tuition rate, regardless of their home state. Regis delivers accelerated and evening courses, with most featuring six start dates per year. Distance learners can avail themselves of the 80,000 e-books in the school's library, in addition to writing and subject tutors available through the Learning Commons. Writing coaches assist students during every phase of the writing process, from organizing and developing ideas to crafting thesis statements and correcting grammar and punctuation. Academic success workshops tackle time management, exam-taking, and study skills. Applicants for this marketing degree online need a high school diploma with an average of "C-" or better, transferable credit from a regionally accredited institution, and demonstrated work experience. Other admission requirements include a personal statement and a $50 application fee. Prospective students should submit their applications no later than two weeks prior to their desired start date. Additionally, degree candidates can earn up to 90 credit hours through prior college credit, military credit, professional licenses/certificates, and work experience. A Texas liberal arts university, DBU prides itself on a strong commitment to educating working professionals. Additionally, every academic program the school offers features a Christ-centered perspective. The school's 120-credit hour bachelor's of business studies in marketing consists of 39 to 49 general studies credit hours, 41 to 51 elective credit hours, and 30 credit hours in the marketing major. Courses in the final category include managerial statistics, business and public law, and marketing principles. Students set their own pace, typically taking six to nine credits during traditional semesters in fall, spring, and summer. Alternatively, degree candidates can choose accelerated semester options that allow them to enroll in overlapping, concurrent, or linear classes throughout the entire year. Distance learners can earn DBU's marketing degree online by devoting 10 to 15 hours per week to asynchronous courses. Degree candidates use the Blackboard LMS to access course content and must meet specific deadlines. The school's distance learning programs boast small class sizes, with an average of 12 students. Distance learners can turn to DBU's Writing Center for help completing papers, and can access a 24/7 help desk for technical support. Graduation requirements include coursework in the Old and New Testaments, in addition to a 2.0 minimum cumulative (major and minor) GPA. Prospective students can avoid the application fee by submitting all required materials online. In addition, all applicants must write an essay explaining their interest in DBU and submit their official transcripts. Applicants can transfer up to 66 credit hours from accredited two-year colleges; DBU only offers credit for such classes if students earned a ‘C’ or better. Online marketing programs like DBU's offer additional credit for students who take college-level exams or have prior military or corporate training. Those with prior specialization in college may be able to waive the minimum required 42 credit hours of upper-level courses through the school's Inverted Degree Program. California Baptist University, a private Christian university based in Los Angeles, offers 40 majors and degree concentrations fully online, and most can be completed within 16 months. Several learning centers throughout California also provide students an option to complete some of their classes in person. CBU’s online bachelor of science in marketing can be completed either fully online or as a hybrid program fit the demands of busy working professionals. Students in the program analyze and predict consumer needs, use statistical data and proven communication strategies to create ad campaigns, and develop branding movements that are profitable and sustainable. Graduates can pursue their master’s degree or professional opportunities as advertising sales agents, green marketers, or market research analysts. Online marketing degree students must earn 120 credits to receive their degree, and prospective students must have at least 24 transfer credits with a minimum 2.0 GPA from a previous institution. CBU accepts up to 100 credits, 30 of which can be upper division coursework. Students may complete their remaining credits at CBU Online, with advanced topics like business law, consumer behavior, and retailing and merchandising. No capstone or internship requirements are requires, but students are encouraged to take on an internship experience. Classes begin every eight weeks and students can enter the program at their convenience. All distance learners pay the same tuition rate. Financial assistance is available, including grants for California residents and institutional awards for academic achievement and adult learners. NSU's BA and BS in marketing degrees each offer students the choice of five concentrations: marketing management, professional sales, digital and social media, service and retail marketing, and global and regional markets. Each 120-credit program, in addition to 30 credits in general education, includes 39 credits in business core courses, 12 credits in marketing major requirements, 27 credits in open electives, and 12 credits in the student’s chosen concentration. Courses cover a range of topics, including business law, organizational behavior, customer value & relationship marketing, and corporation finance. NSU's College of Business and Entrepreneurship partners with more than 100 corporations to provide candidates with a well-rounded selection of internship opportunities, competitive projects, networking opportunities, and on-site corporate visits. Students can further enrich their school experience by participating in the NSU chapter of the American Marketing Association. Additionally, the school's Distinguished Lecture Series gives learners a glimpse into the minds of successful entrepreneurs through regular lectures followed by question-and-answer sessions. Past speakers include Jack Welch, U.S. Supreme Court Associate Justice Clarence Thomas, and Alan Potamkin. Aspiring marketers can also benefit from NSU's Executives and Entrepreneurs-in-Residence program, where highly accomplished business executives coach and engage with business students in scheduled, one-on-one mentoring sessions to provide a singular experience and invaluable feedback about career goals. NSU breaks its fully online sales and marketing degree into eight-week terms, during which distance learners interact with their instructors and classmates through online bulletin boards and real-time virtual classes. Students in NSU's online marketing programs pay the same per-credit tuition rate as on-campus students. The school reviews applications on a rolling basis, requiring official transcripts in addition to a nonrefundable fee. In addition, NSU provides a variety of financial aid opportunities, including grants and merit-based scholarships (for full-time students only), with some catering specifically to Florida residents. Located in the Pioneer Valley of western Massachusetts, UMass Amherst serves as one of the nation’s leading public research universities. The school's online bachelor’s of business administration in marketing program encourages distance learners to become master storytellers to promote a brand and sell products. As they progress through the curriculum, students also learn how to analyze data, how to price products, and evaluate buying decisions. To earn their degree, distance learners must complete 120 credits (at least 45 through UMass Amherst), including 12 credits in general education, 34 credits of business core courses, 12 marketing credits, 21 credits of non-business electives, and two upper-level business electives. Business courses cover a range of topics, like principles of managerial accounting, business data analysis, and an introduction to law. Upper-level electives can come from a variety of disciplines, including sport management and operations and information management. Online students use the Blackboard LMS to access course content. Support services include a transitions course to help orient distance learners, online advising (including assistance with applications and class selection), and a 24/7 online help desk. Those graduating with an online sales and marketing degree can attend commencement ceremonies and the senior celebration on campus. UMass Amherst charges the same tuition for all distance learners, regardless of residency. Additionally, the school offers generous financial aid opportunities to sophomore and junior students through its scholarship program. Military benefits include lower fees, the ability to delay studies without paying a penalty, and dedicated advising to meet the specific needs of servicemembers. Admitted students can transfer a maximum of 75 credits. UMass Amherst accepts applications for fall admission April 15 through May 15, and provides an application window of October 1 through November 1 for spring admission. Prospective students generally need a 3.0 GPA or higher, although the school considers other criteria as well. Applicants can enroll in online courses “a la carte” to get a head start on earning credits. Residents of Alabama and Arkansas cannot earn online marketing degrees through UMass Amherst. Founded as a Christian liberal arts university in 1893, today CSP attracts a diverse group of students from different backgrounds, faiths, ages, and cultural traditions. The school offers a bachelor's of arts in marketing as a 40-credit program that features seven-week courses. Students working toward their digital marketing degree online enroll in a range of courses centered in business, finance, and marketing. Required courses include ethical management principles, innovation and systems thinking, new media literacy and social media, and business strategy plans. Learners must complete a total of 120 credits to earn their undergraduate degree. CSP's fully online marketing degree features only asynchronous classes with limited lectures and an emphasis on real-world learning in an interactive setting. Degree candidates progress through the curriculum in a cohort that facilitates the development of professional relationships and networking opportunities. The school partners with area employers to provide a $2,000 tuition discount to employees who enroll in accelerated undergraduate programs. CSP also provides $2,000 scholarships to undergraduate transfer students from 35 community and technical colleges in Minnesota and Wisconsin. Additionally, transfer learners benefit from priority admission and the chance to earn their degree in two years or less. To help students better manage educational costs, CSP locks in tuition rates for the duration of continuous enrollment and waives the application fee for distance learners. The school also offers discounted tuition to active-duty military servicemembers. Otherwise, all students pay the same rates regardless of their state of residence. Prospective students should submit official transcripts with their online application. Applicants need at least a 2.0 GPA, and must provide a personal statement of at least 300 words regarding their educational and career goals. Those who recently graduated from high school and who have earned no college credit must submit ACT or SAT scores with their online application. Located in Minot, North Dakota, MSU has offered online degrees through its Center for Extended Learning since 1997. All of MSU's nine undergraduate programs can be completed entirely online with no on-campus requirements. Administered by the school's Department of Business Administration, MSU offers a regionally accredited online marketing degree that prepares students to create and promote product and service marketing campaigns in a variety of business, industry, and government settings. The online marketing degree's curriculum covers foundational business topics like analysis and planning concepts, entrepreneurial and cross-cultural concepts, decision-making and organizational skills, and more. Students can choose to customize their studies with concentrations in management, marketing, marketing education, and international business. Students must also complete an internship component, which they may even develop themselves with guidance from an advisor. The internship can be completed on a part-time, full-time, or project basis. Students must complete 120 hours of coursework across general education requirements, College of Business core classes, and marketing-specific courses. Classes may be taken synchronously or asynchronously and in either 16-week or eight-week sessions. Each online marketing course is taught by the faculty and with the same curriculum as its on-campus equivalent. Tuition and fees at MSU are charged per credit hour. Distance learners pay the same as on-campus students, making it one of the best online marketing degrees for out-of-state students in terms of cost. Distance learners have access to several online resources at MSU, including free Smarthinking tutoring services, an online writing lab, and an online advisor for academic planning. MSU encourages residents outside of North Dakota to review its State Authorization page before applying to ensure that their desired program is offered online in their state. New Mexico State University enrolls over 15,000 students annually in its degree programs, many of which are available via the school’s distance education platform. The online bachelor of business administration in marketing is designed as a degree completion track, which requires prospective students to transfer general education courses and major prerequisites. Courses at NMSU then develop skills to identify specific consumer markets, both in the for-profit and nonprofit sectors, to connect with customers through interactive and ethically mindful advertisement campaigns. Students also develop financial management and group leadership strategies to be effective leaders across government agencies or multinational corporations. All major classes are completed online via Canvas. The 128 degree plan consists of coursework in areas like advertising strategies, product/service delivery methods, and consumer behavior. Students must also complete an internship, which is facilitated by the department and fulfilled over the summer in Las Cruces or where they live. NMSU believes these experiences allow students to gain real-world work experience in the kind of company or organization they wish to engage with after graduation, while also accelerating a student’s professional development. Tuition for this marketing degree online program is based on residency status and financial aid is available. Distance learners enjoy a multitude of services and support, including online subject and writing tutoring, special programs for high achieving students and those in underserved groups, and a career services center. Located in the heart of Philadelphia, PA, Temple University features 17 schools and colleges with over 100 flexible academic programs for its diverse student population, many of whom are distance learners. The fully online bachelor of business administration with a major in marketing focuses on the statistical and analytical data that drives product innovation, pricing, and the creation of effective promotional campaigns. Temple students immerse themselves in case studies and simulative projects to master qualitative data methods and human behavioral theories. Graduates pursue careers in expanding fields such as digital marketing, customer relationship management, logistics, and consumer research. The 120 credit online marketing bachelor's degree features courses in professional selling, principles of supply chain management, and value delivery networks. Students must also complete an internship or cooperative experience -- approved by the marketing department -- that facilitates hands-on work and leadership experience in their local communities or in the Philadelphia area. Degree candidates also have a number of elective and independent study hours to pursue advanced topics or independent research. Though it’s not a requirement, students who wish to eventually earn a graduate or doctoral degree are encouraged to complete a thesis. The Temple program values specificity in curriculum design and students work closely with academic advisors and faculty to chart the degree course that best suits their goals. Furthermore, students can earn their BA at an accelerated pace, finishing in three years and making them eligible to apply for Temple’s five-year master’s degree pathway. All online students pay the same affordable tuition rate, and are automatically considered for academic scholarships. To apply, candidates submit academic credentials with a minimum 3.0 GPA, ACT or SAT scores, and an application essay that highlights academic and professional achievements. Located in Georgia, KSU delivers a bachelor's of business administration in marketing through its business college, the second largest business school in the state, with 6,000 students, 160 faculty members, and a far-reaching alumni network. Faculty conduct quality research at more than 10 institutes, and their findings frequently feature prominently in top-tier journals. KSU's Center for Professional Selling offers video tools for practice and simulations, tenured faculty who teach and mentor, and the National Collegiate Sales Competition, all of which help make the school's program one of the best online marketing degrees available. KSU's online marketing degree features four concentrations. The channels marketing concentration focuses on traditional and online retailing in addition to business-to-business marketing. The social media and engagement marketing concentration emphasizes digital, mobile, and multimedia marketing. The sports and hospitality track immerses degree candidates in marketing for entertainment, sports, restaurants, tourism, and hotels. The professional sales concentration teaches students how to create effective sales presentations and to manage a sales force. The 120-credit program includes general education requirements, lower- and upper-division course requirements, three leadership and career program courses, a single course on information systems management, and electives. Requirements include algebra, calculus, and microeconomics courses. Students learn from the best in their fields, including the heads of leading Atlanta businesses. Distance learners enjoy access to the same support services as their on-campus counterparts, including tutoring, advising, a help desk, bookstore, and library. An online orientation helps degree candidates understand program expectations, how to access online resources, and technology requirements. Courses available almost entirely online typically require one visit to campus each semester (for example, an in-person exam). Some online courses feature a synchronous format with evening sessions. Online students pay the same tuition regardless of where they live. All degree candidates must complete the program within six years of admission. A top-ranked state university, UW-Whitewater features a bachelor's of business administration in marketing that gives students the credentials necessary for jobs as sales managers, market analysts, and internet marketers. The curriculum combines marketing courses with a full suite of business courses in accounting, business law, economics, finance, information technology, and supply chain management. In all, the program includes degree-specific requirements, lower- and upper-division business requirements, 24 credits in the marketing major, general education requirements, and elective credits. Students with previous college-level coursework in calculus may be able to waive certain requirements. Degree candidates must also complete 20 hours of community service before enrolling in a particular management course required for business majors. A full course load for UW-Whitewater's online marketing degree consists of 12 credits. Courses last from three weeks in the winter to 16 weeks in the fall and spring semesters. Distance learners can complete the program entirely online, or mix online and on-campus courses. Students typically take exams online, but some courses may require proctored tests. Instructors encourage dialogue and participation in asynchronous classes. Online students can connect with faculty, alumni, and their peers through social media and live streaming of campus events. Additionally, distance learners can seek support in the form of advising, tutoring, and library services, not to mention career services like interview preparation, help with job search strategies, an online job board, career fairs, and internships. To graduate with a digital marketing degree online, students need to maintain at least a 2.50 GPA in all business courses and in the major. Degree candidates need to earn at least 30 of their total credits at UW-Whitewater. Applicants must have a GPA of 2.8 or above. Candidates should apply two months ahead of their intended start date. All distance learners pay the same tuition rates, regardless of residency status. Located in Virginia, ODU tailors its bachelor's of science in business administration degree to marketing students aspiring to success in advertising and sales, public relations, retailing, and brand and product development. The school's online marketing programs involve upper-division business courses like accounting principles, microeconomics, and statistical data analysis, as well as marketing courses like multinational marketing and consumer behavior. Students earning their bachelor's in business administration through a degree completion program can choose among three concentrations: digital marketing, marketing analytics and research, and professional sales. ODU offers a host of student support services to facilitate academic achievement. The school's Undergraduate Research Program connects top learners with faculty who actively mentor research projects, thereby giving them a competitive edge in graduate school or research careers. Additionally, the university's Peer Educator Program consists of trained peer tutors and mentors who provide services to all undergraduates at no charge; these services include one-on-one coaching on organizational skills, testing techniques, presentation skills, and study strategies. The school's Writing Center provides counseling and online tutorials, while Student Outreach and Support helps learners overcome personal, administrative, or academic roadblocks. Other student support services cater to first-generation college students, low-income students, and those with a disability. Courses feature both live and asynchronous formats. In the asynchronous classes, students access course material online and complete assignments at their own pace, but only to a certain extent in that they must adhere to certain deadlines. Students pursuing an online degree in marketing must complete at least 30 credit hours at ODU toward the required total of 120. In addition, they must earn a minimum GPA of 2.0 in all major courses. Certain prospective students who have completed at least 15 credit hours through the Virginia Community College System can count on a relatively easy transfer to ODU's undergraduate programs. Harding University, located in Searcy, AK, was founded in 1924 as a senior college. Today, Harding is a comprehensive institution focused on career-relevant and ethically positive academics. Distance learners have several options for fully accredited degree programs, including an online bachelor of business administration in marketing. This bachelor’s in marketing emphasizes a well-rounded education that develops fundamental business theories, technological know-how, communication skills, and the global awareness and high ethical understandings that make an effective leader. Students can pursue their degree entirely online via asynchronous courses, or take flexible, campus-based classes for a hybrid learning experience. The 128 credit curriculum includes general education, business core, and advanced major topics. Classes include promotional strategies, management and organizational behavior, and personal finance. Students also complete a capstone seminar in marketing strategy that integrates what has been learned throughout the program into an independent project and presentation. These seminars are also opportunities for students to pursue topics relevant to them and conduct research that will help in further professional pursuits. Though an internship is not required, students who wish to pursue a hands-on learning experience may receive support from the department when searching for and facilitating their experience. Both the Bison Career Search and Career Services can assist students with internships and career opportunities after graduation. Additionally, the Center for Professional Excellence can help students hone resume writing and interview skills. Application materials include academic credentials and standardized test scores. Candidates with 14 hours or more of transferable credits from a regionally accredited college or university are not required to submit SAT or ACT results. Harding prices tuition at the same affordable rate for all distance learners. Scholarships are available, including a yearly $2,500 award for transfer students with a 2.5 GPA or higher. Cleary University is a business school located in Ann Arbor, Michigan with two other campuses across the state. Cleary offers several innovative bachelor's of business administration programs, including an online marketing degree. This program places an emphasis on global industries, the growing role of digital media, and core strategic marketing functions. The BBA is offered entirely online and prepares students for careers in any industry. The 120-credit program takes four years to complete, although eligible students can transfer up to 90 credits from another institution towards their degree. Students study a variety of marketing topics, including enterprise marketing, multimedia writing, SEO, financial management, and more. All courses are taught by diverse practitioner-faculty in small class sizes with an average student-to-faculty ratio of 11-to-1. The courses follow a methodology based on experiential learning that includes projects, case studies, and other formats that require real-world decision making. In their final semester, students must complete two professional projects: an individualized assignment based on business concepts learned throughout the program, as well as an evaluation and report on the previous project. This final portion of the program is delivered in a blended in-person and online format, meeting synchronously during the first and last weeks of the session. Access to an online library, learning tools, and a research blog as well as all coursework through Moodle is available to online students 24/7. Upon graduating, students will be qualified to sit for the Professional Certified Marketer certification exam administered by the American Marketing Association. The marketing degree at Cleary is accredited by the Higher Learning Commission. Founded in 1900 as an institution for women in Gainesville, GA, Brenau University is now a liberal arts university with several coeducational campuses and a robust online presence featuring accessible academic offerings to everyone. Distance learners have several options for degree programs, including the online bachelor of business administration in marketing, which emphasizes customer needs throughout the marketing process. Students learn to lead teams through the initial assessment of underserved markets to designing innovative products and services. They also explore pricing strategies and how to create advertisements and other campaigns that connect with consumers and build brand recognition and loyalty. The 120 credit degree plan consists of a liberal arts education core and major coursework in areas like human resources management, international marketing, and strategic thinking and innovation. Degree candidates must also complete a business capstone seminar their senior year. A project-based course, students in the capstone analyze the current business environment for challenges, and propose solutions that aligns with the theories and best practices they’ve learned. The Brenau marketing bachelor's degree online program is nationally recognized for its academic rigor and student achievements. Graduates find successful careers as market researchers, social media marketers, and nonprofit campaign managers, to name just a few positions. Prospective students can apply at any time via the rolling admission process. Application materials include official diplomas with a minimum 2.5 GPA for recent high school graduates and 2.0 for college transfer candidates. No standardized test scores are needed. Remote classes are asynchronous and facilitated through Canvas. Distance learners enjoy around-the-clock technical support through the Online Student Center. The OSC also assists with course planning, internship coordination, and professional development opportunities. Students can access online tutoring via the Writing Center and Math Study Place of Achievement. UM delivers an online bachelor's of business administration with a concentration in marketing management. A metropolitan research university, the school has grown since its opening in 1912 and today enrolls over 20,000 degree and certificate candidates. A standout among accredited online marketing schools, UM’s College of Business & Economics provides one of the best online marketing degrees available to students eager to learn about pricing, buyer behavior, market research, promotions, and sales management strategies. General education courses comprise 41 hours in the program, while major-specific requirements make up another 42 hours with courses covering topics like the legal, social, and political environment of business. The degree includes another 24 hours in upper-level courses in addition to 13 hours of electives. In total, distance learners must complete 120 hours to earn their degree. Online students use eCourseware and the Desire 2 Learn LMS to access primarily asynchronous course content developed by UM faculty. New freshmen and transfer students must attend an on-campus summer orientation to meet with their academic advisers and register for classes. The school provides support services to those with questions about registration, advising, technology, career assistance, and tutoring. Career assistance includes online practice interviews, details about career fairs, and job and internship openings. Distance learners can schedule telephone appointments for guidance on choosing a major, preparing for graduate school, and crafting a career plan. Smart Start helps prepare working professionals using a web-based assessment that generates a customized readiness plan. Students can then sharpen their distance learning skills before beginning the online program through practice course modules. Generally, the university makes applications available about one year before a prospective student's first term. High school students can submit their applications as early as the October following their junior year. FHSU delivers more than 40 online degrees to more than 6,000 distance learners. The school’s fully accredited bachelor's of business administration in marketing program covers retailing, advertising, wholesaling, market research, business-to-business marketing, governmental marketing, and public relations. Students earning their online marketing degree participate in applied learning experiences such as internships, service learning in a business setting, study abroad, student organizations that sponsor conferences and competitions, and guest lectures as they complete the required 124 credits. Required coursework for FHSU's marketing degree online includes 55 hours of general education, 27 hours in the College of Business & Entrepreneurship's core curriculum, 18 hours of marketing core courses, 12 hours of marketing electives, six hours of marketing electives, and six hours of free electives. Students can earn their degree full-time or part-time. Distance learners communicate with instructors in small classes using the Blackboard LMS, fax, Skype, phone, and email. Some courses feature an asynchronous format, with instruction available through CD-ROMs, DVDs, guided study, or the internet. Other courses require synchronous participation, using face-to-face interaction and internet protocol television. Some exams may require students to locate a test proctor in their area. To optimize students’ academic experience, a personal adviser assists with program and course selection. FHSU provides free online tutoring that includes one-on-one sessions with a live tutor, an online writing lab, an online orientation, and career services that help with interviewing skills and job hunting. The university's online tuition ranks among the lowest 2% of academic institutions in the nation, and all distance learners pay the same rates regardless of their residency status. FHSU accepts certain transfer credits from other schools and awards credit for military experience and through assessment. Prospective students over age 21 don’t need to submit exam scores with their application, but all applicants must provide sealed, official transcripts. As part of the National University System, City University of Seattle is a private nonprofit institution that enrolls nearly 7,000 students annually in its traditional and distance education program. The latter includes fully accredited degrees like the online bachelor of science in business administration with an emphasis in marketing. With flexible, asynchronous course options, students can earn their BSBA entirely online or as a hybrid experience, finishing in as few as three years. City University’s program is comprehensive, as students learn business negotiation, persuasive communication, technological integration, and research analysis to prepare them for careers in government agencies, international businesses, nonprofit organizations, and more. The 180 unit curriculum consists of courses such as effective organization, global marketing, and advertising and sales promotion. There are no capstone or internship requirements, but students can pursue their own practicum with the help of the CityU Career Center. Undergraduate students can complete 150-hour marketing internships in their area or during the summer in Seattle, earning valuable hands-on work experience and college credit. Distance learners also enjoy a variety of other resources and services, including personalized advising, counseling, library privileges, and the opportunity to engage with campus clubs and organizations. To apply for CityU’s online marketing degree program, candidates submit academic credentials and complete an online application form. The university welcomes students of all backgrounds and does not require standardized test scores or a specific GPA. All distance learners pay the same affordable tuition rate and have access to financial aid, including scholarships specifically for transfer and international students. Awards are also provided based on merit, need-based, and diversity criteria. CityU has a generous transfer policy to further reduce overall costs. Students can apply up to 135 units towards degree completion, provided they have a minimum 2.5 GPA or higher. Wilmington University, based in New Castle, DE, enrolls over 20,000 students throughout its campuses and education centers in Delaware, New Jersey, and Maryland. WilmU also offers over 90 degrees, concentrations, and certificates completely online, including the fully accredited bachelor of science in marketing. This BSM track emphasizes topics like product development and consumer behavior, while preparing graduates to continue their education in a master’s degree or to pursue entry-level professional opportunities as market researcher, sales manager, entrepreneur, and much more. The 120 credit curriculum includes coursework in areas like mobile marketing, public relations, and strategic management. The curriculum also features several open and guided electives for students to pursue advanced topics or conduct independent research that bolsters their qualifications for graduate schools. Though no internship requirement is present, the marketing department helps students locate opportunities that align with their career goals. WilmU also fosters a cooperative education environment, which combines theoretical knowledge with hands-on application and lets students use current work experience to fulfill certain course requirements. Online coursework is asynchronous and delivered via Blackboard. Application materials include previous academic credentials and ACT or SAT scores. No minimum GPA is required. All online students pay the same affordable tuition rate and can apply for financial aid. Wilmington offers state grants through the Delaware Goes To College initiative as well as private scholarships and loans. Founded in 1959 in Bismarck, ND, the University of Mary offers 54 undergraduate academic programs to traditional and distance learners, including an online bachelor of arts and bachelor of science in marketing. Students in this program recognize and anticipate customer demands using consumer research and analytics, which enables them to position products and services to connect with the market in innovative ways. Marketing is a vast field, and Mary graduates are prepared for careers that include digital marketing, brand management, and international business. Students can earn their degree entirely online via asynchronous coursework, or through a hybrid delivery offering that combines flexible evening classes at the Bismarck campus. The 120 credit curriculum includes major coursework like consumer behavior, international business management, and marketing research methods. Degree candidates must also complete an internship (or experiential development experience) with a company or organization in their community in order to demonstrate their leadership and marketing skills. Students in the internship are well-supported by the site coordinator and a faculty advisor. Remote courses start every five weeks and are delivered via Canvas. Students can begin the program when it is convenient for them and, because classes are accelerated, students can finish in as few as three years. Transfer students may apply previously earned credit to a degree completion track. To apply, candidates submit a professional resume or CV, two recommendation letters, and academic credentials with a minimum 2.5 GPA. Standardized test scores are not needed, but will be considered as a holistic part of the potential student’s application package. Mary boasts competitive tuition rates and financial assistance is available, including the Impact Scholarship for nontraditional students. The University of Louisiana at Monroe offers one of the best online marketing degrees in the state through its online school, eULM. The online bachelor's of business administration prepares students for the most in-demand careers today, in fields such as brand management, industrial marketing, advertising, purchasing, retailing, market research, and other sectors. The program is accredited by the Association to Advance Collegiate Schools of Business. The 120-credit curriculum includes general education classes, core business courses, and allows students to choose a minor in a non-business discipline in their junior year. Required courses include personal selling, advertising and sales promotion, digital marketing, and integrated marketing campaigns. Students can choose from one of two concentrations, management and marketing, making ULM's BBA a good option for students who wish to pursue an online sales and marketing degree path. The program can be completed in four years of study. Part-time students who plan to study while also working full-time are welcome to apply. Online courses are delivered through Moodle, and students can stay organized with mobile and desktop tools like the My Homework Application, which can schedule and plan assignments. Courses at ULM are offered in four-, eight-, or 16-week formats depending on the class and semester. Class sizes are kept small to encourage faculty to give all students one-on-one attention. ULM offers a variety of scholarships for out-of-state students, transfer students, and adult learners aged 60 and older. Online undergraduate students all pay the same tuition costs per credit hour. ULM also offers prior learning assessment options for applicants who have passed qualifying exams and courses, or who present a portfolio of past professional experiences. UMUC in Adelphi offers more than 90 degrees, certificates, and specializations. The university's bachelor's of science in marketing requires 120 credits to complete and covers topics like consumer behavior, online marketing and product development. Additionally, degree candidates learn to use market intelligence to create effective marketing plans that respond to specific industry challenges. Other curriculum components may include case studies, development of marketing communications plans, and formal defense of marketing recommendations. As part of the required 120 credits, students must complete 43 credits of minor courses and/or electives. UMUC's entirely online marketing programs feature faculty who have held titles like chief marketing officer, president, and director of marketing for many well-known brands, including Colgate Palmolive, H&R Block, Hewlett-Packard, Procter & Gamble, 3M, Verizon, and Sara Lee. Recognizing that students place a premium on flexibility in online marketing programs, UMUC offers several convenient organizational tools for distance learners. Namely, online students can use an interactive calendar to monitor deadlines and track assignments, access their online classroom using their tablet or smartphone, and receive audio feedback from their instructors. However, even asynchronous courses require degree candidates to meet weekly or biweekly assignment deadlines. Most classes measure student progress through essays or final projects rather than traditional exams. Distance learners can participate in the school's Marketing Club to make valuable connections with peers and develop professional networks. UMUC divides its program, which features multiple start dates each semester, into eight-week sessions that allow students to concentrate on fewer classes at once. To help shorten the time it takes to complete their degree, distance learners can earn credits through assessment and for prior college, workplace learning, military experience, and vocational training. Additionally, the school permits degree candidates to transfer a maximum of 90 credits. UMUC accepts applications on a rolling basis, and does not require any exam scores for admission to the program. Located in Melbourne, Florida Tech is the only independent technical college in the region and boasts an expansive network of 60,000 alumni worldwide, including Fortune 500 CEOs. Florida Tech's College of Business is accredited by the International Assembly for Collegiate Business Education to award undergraduate degrees completely online, including an online degree in marketing. The BA in business administration curriculum includes general education requirements and core business topics to provide students with a broad foundational knowledge. Core business courses cover topics including business analytics, global marketing, ethics, product and service development, logistics and transportation, pricing strategy, and advertising. Online courses at Florida Tech are delivered asynchronous in eight-week terms. Students can complete the 124-credit program in four years of full-time study. Enrollment is flexible, with six start dates throughout the year, and there is no application fee. Florida Tech allows students to transfer credits from a regionally accredited school as long as students have earned a grade of "C-" or higher in each course. Tuition is the same for all students, regardless of residency. Law enforcement, public safety professionals, and military service members may be eligible for discounted tuition. Students complete coursework through several online formats including video, interactive media, discussion boards, and chat rooms. Students receive individualized attention from their instructors -- 90% of whom hold a doctorate -- and have access to extensive support services. In addition to enrollment services, students can speak to student service representatives who assist in everyday tasks like ordering textbooks and registering for classes. Florida Tech also offers students access to an online library, Smarthinking tutoring, and career management services. Located just a short drive from Los Angeles, CA, Azusa Pacific University offers 80 undergraduate degree programs, many of which are accessible for distance learners. The online bachelor of arts in management with an emphasis in digital marketing is offered completely online, while the asynchronous coursework emphasizes discussion and cooperative learning. Degree-seekers integrate web-based strategies with proven marketing strategies and research techniques to create brand campaigns that connect with consumers on a global scale. The 120 credit degree plan is divided into 60 credits of general education requirements and 60 in major coursework. Topics include cross-cultural communications and negotiations, global viral marketing, and digital consumer behavior. To further highlight the global scale of the APU digital marketing curriculum, students complete an international study capstone by pursuing either a study abroad experience in conjunction with guided coursework and hands-on skill building, or by conducting in-depth research on a specific country or region. Students are also encouraged to narrow their career goals through this experience, which also prepares them to work in international business and trade. A minimum 2.5 GPA is required to earn the degree. To qualify for APU’s online bachelor's degree in marketing program, applicants must have at least a 2.0 GPA. The university bases its affordable per-credit tuition rate solely on the level of each course, with advanced classes costing slightly more than introductory ones. Every student receives their own success coach, who helps them through admission, course planning, career development, and even provides support for the personal challenges they may face while working on their degree. Around-the-clock online tutoring is also available. As part of the renowned Texas state education system, The University of Texas at the Permian Basin offers 25 undergraduate and graduate degrees fully online, including the bachelor of business administration in marketing. UTPB provides a comprehensive overview of key business skills, while also preparing graduates to for positions in social media marketing, international finance, and nonprofit fundraising. Students in the program organize and lead teams through the entire life of a project, from identifying consumer behavior and designing an attractive product/service, to conducting effective brand campaigns and analyzing results. The 120 credit curriculum consists of course areas like marketing research, information system fundamentals, and management concepts and organizational theory. Students must also complete a strategic management senior capstone in which they analyze how decisions are made and what plans were implemented within a contemporary case study. This is a research intensive course that prepares graduates for the type of rigorous academics they can expect at the master’s and doctoral degree levels. All online classes are asynchronous and facilitated via Blackboard. Courses last eight weeks and with six start dates each year, students can enter and complete the BBAM at their own pace. UTPB’s tuition is affordable, and all distance learners pay the same per-credit rate. Financial aid is also available. This is a partial degree completion track and potential students need at least 24 transferable credits with a minimum 2.0 GPA in order to be eligible for the program. Applicants who do not meet the criteria may still be admitted on a conditional basis. No SAT or ACT scores are necessary. Located in Waxahachie, TX, Southwestern Assemblies of God University is a regionally accredited institution that offers a comprehensive list of residential and online undergraduate degree programs, including the online bachelor of science in business marketing. Students in this program develop a full understanding of standard business ideas and strategies, and analyze consumer data to create promotional campaigns, including viral ads and social media brand movements. SAGU graduates are prepared to work as operational researchers, sustainability consultants, financial planners, and other growing positions. The 120 credit degree includes major coursework like management communications, strategies and policies in business, and digital marketing. The SAGU curriculum also contains a significant amount of electives for students to pursue personal interests in the field or earn a complimentary minor. Additionally, students complete an internship that facilitates real-world skill training and networking. Opportunities are facilitated through the department with the help of a faculty coordinator and students have the option to work in their communities or over the summer in Waxahachie. Students can expect personal attention from their instructors and the administration, including career assistance. All online marketing degree courses are asynchronous and delivered via Blackboard. Several classes are even offered to current high school students, who can take advantage to jumpstart college degree completion. Application materials include school diploma with a minimum 2.0 GPA and standardized test scores: at least 19 on the ACT or 1350 on the new SAT. SAGU offers a number of financial aid opportunities on top of their affordable online tuition rate, including a grant specifically for distance learners. Northwest Christian University was established in 1895 as a divinity school, but today offers a full list of academic programs to 800 students annually, many of whom pursue their coursework and degrees from the comfort of their homes. The bachelor of science in business administration with a concentration in marketing can be earned either completely online, or as a hybrid model that features flexible classes one night a week at the Eugene, OR campus. BSBA students develop core financial and strategic management skills necessary for all careers in the field, and graduates are prepared for careers in digital marketing, consumer research, and international finance. The NCU program emphasizes hands-on learning through project-based learning and practicum; as a result, all students graduate with at least 135 hours of field experience. The 120 credit degree includes course topics like history of entrepreneurship, advanced data analysis, and branding, marketing, and promotion. Students also develop fundamental business research skills and participate in an internship, a guided practicum in which students demonstrate learned skills, gain real-world work experience, and cultivate professional relationships. All degree classes are remote and asynchronous, while an eight-week, accelerated pace for each course allows students to complete the degree on-time while working full-time. NCU’s marketing degree online program has six start dates each year. All distance learners pay the same affordable tuition rate regardless of residency status, and may also apply for financial assistance, including loans, private scholarships, and a generous award for Oregon residents. NCU offers a variety of student support services and resources, including online tutoring, personalized advising, and veteran benefits. Career development resources are also available to offer skill assessment, training, and internship placement. Texas State University is one of the largest public institutions of higher education in the state, enrolling nearly 40,000 students in 98 undergraduate programs. Distance learners can earn many of the the same degrees as their on-campus counterparts, including a bachelor of business administration with a major in marketing. Taught by respected professionals in the field, the TSU program prepares graduates to enter the dynamic and competitive business world, which increasingly requires employees with technological prowess and an in-depth understanding of global markets. Via skilled instruction and cooperative learning, students gain practical work experience and a portfolio of projects that prepare them for graduate studies or careers in rapidly expanding fields like governmental research, physical distribution, and product and brand management. The TSU online marketing bachelor's degree is a hybrid program that requires students to take flexible evening and weekend classes at the San Marcos campus or various off-campus locations in the area. The 120 credit curriculum includes major coursework in free enterprise, business finance, and marketing for social change. Students enjoy a great deal of autonomy over the degree plan, and use guided electives to pursue topics relevant to their specific interests and professional goals. Though it is not a requirement, students are also encouraged to pursue a marketing internship. Those in the Honors College are required to complete independent research and a thesis. To apply, first-time students submit their high school diploma and standardized test scores. Those who graduate in the top 25% of their class or score 27 on the ACT (1200 for the SAT) are automatically admitted. Full transfer candidates (those with 30 or more credits at a minimum 2.5 GPA) are exempt from sending test scores, and receive automatic enrollment if their GPA is 3.25 or higher. Founded in 1895, the University of Massachusetts - Dartmouth belongs to one of the most prestigious public university systems in the U.S. The school enrolls over 7,000 undergraduate students annually, including distance learners who can earn fully accredited degrees like the online bachelor of science in marketing. The Dartmouth campus explores all phases of product/service marketing and distribution, with an emphasis on evidence-based decision making and identifying consumer demands through behavioral studies and data sets. Graduates are well-prepared to occupy leadership positions in growing fields like sales management, research analysis, and e-commerce and social media marketing. The 120 credit curriculum includes courses like integrated marketing communication, the legal framework of business, and strategic management. Students can also personalize their degree plan through free and guided electives. No capstone projects are required, but the Dartmouth program does emphasize hands-on skill development and professional networking through an internship. With help from the Charlton College of Business, degree candidates can find internships at influential companies and organizations such as Avis Budget Group and Kraft Sports. Students can also work with clients on a number of outstanding projects via the university’s Center for Marketing Research. Additionally, advisors and faculty provide advice and support for students as they pursue a graduate degree program or an entry-level career. The application process for this online bachelor's degree in marketing program includes the submission of academic credentials and SAT or ACT scores for candidates with fewer than 13 transfer credits. Online tuition is charged per three-credit course. A number of awards are available, including the Ryan David Reaves Memorial Scholarship, designed specifically for online undergraduate students. Bellevue University, founded in 1966, offers over 80 career-centered academic programs to traditional and nontraditional students alike, including distance learners. Among the many online offerings is the bachelor of science in marketing, a fully accredited program where students learn to solve multi-faceted business challenges through persuasive communication and data-driven strategies. Students also explore consumer behavior and market conditions in the U.S. and around the world, and build a portfolio through analyzing case studies and engaging in cooperative work with peers and faculty. Graduates are prepared for careers in important fields like brand management and nonprofit marketing. The 127 credit online marketing degree includes major classes in marketing channels, critical business communications, and problem solving and analysis. Students also complete a capstone experience, where they investigate the strategic role of marketing managers in the success of companies and organizations, and present a final project. The BSM at Bellevue also features several options for electives, allowing students the choice of advanced topics that best align with their professional interests and goals. Transfer students also benefit from these electives, as they can maximize their experience by selecting the classes most relevant to their interests. Bellevue’s online marketing program is a degree completion track, and prospective students must have at least 60 transferable credits from another regionally accredited college or university to be eligible for admission. They must also be employed in a marketing-related work setting. All online students pay the same affordable tuition, and military personnel receive discounted tuition rates. Scholarships are available and include awards exclusively for adult learners. Established in 1910 with an initial class of 152 students, West Texas A&M University now enrolls over 10,000 students each year in fully accredited and flexible degree programs, including many online options such as the online bachelor of business administration with a major in marketing. Students in the WTAMU program identify consumer behavior to create and maintain demand for a product or service. Students also develop the fundamental business communication and leadership skills to succeed in careers like sales advertising, product development, and market research. The online marketing degree at WTAMU emphasizes through discussion and project work that fosters professional connections between students and instructors. The 120 credit curriculum includes courses like cross-cultural issues in business communication, portfolio behavior, and marketing strategy. No internship or capstone requirements are present, but 12 elective hours are offered for students to pursue a practicum, research, thesis work, or advanced topics in the field with the guidance of a faculty advisor. All classes are asynchronous, which allows students to access course materials and complete assignments when it suits their schedules. To apply for this online marketing degree program, prospective students submit their diploma with a minimum 2.0 GPA and ACT or SAT scores with thresholds based on their high school rank. Transfer candidates are exempt from submitting test scores, but must meet GPA requirements based on how many credits they intend to apply: 2.50 for 23 credits or fewer and 2.25 for 24 or more. All distance learners have access to scholarships and WTAMU awards more than $4.1 million each year. Located in Highland Heights, KY, Northern Kentucky University provides a comprehensive catalog of distance education programs, including a flexible and fully accredited online bachelor of science in business administration - marketing. Students in this degree learn to analyze market data and lead teams in preparation for carers in fields like brand management, logistics and distribution, and digital and social media marketing. Online coursework is asynchronous, which lets students work full-time and complete their degree when their schedule allows. The 120 credit curriculum includes coursework such as selling skills, consumer insights, and delivering and communicating value. Students can also personalize their degree plan through open and guided electives. The NKU marketing degree online program does not require a capstone or internship to graduate. Five start dates are offered every year, so students can begin degree work at their convenience. To qualify for admission, applicants must submit academic credentials and standardized test scores: at least 18 on the ACT and 890 on the SAT. Both new college students and transfers must take a number of selective admissions classes at NKU, earning a minimum 2.5 GPA, before officially entering the BSBA program. All online students pay the same affordable tuition rate. FInancial aid is available, including scholarships based on academic achievement and student background based on diversity criteria. NKU is a military-friendly school and active personnel and veterans receive additional financial and academic support, including specific funding opportunities and the ability to use their training and field experience to earn college credits. The university also supports distance learners with such services as 24/7 technical assistance, online tutoring, personal advising, and career services. A private, nonprofit university located in Manchester, SNHU stands at the cutting edge of distance learning with more than 75,000 students enrolled in 200 different online programs geared toward busy working professionals. The school's 120-credit bachelor's of science in marketing helps students master direct marketing, sales management, brand communications, international retailing, design, media planning, and advertising. The program also features an optional social media concentration. The curriculum includes mandatory general education and business core courses, degree courses – including a writing-intensive capstone on strategic marketing planning – and electives. Marketing courses cover a range of topics, including professional selling, social media & marketing communications, and consumer behavior. Classes within the social media concentration cover subjects like advertising copy and design and advertising media planning. Available electives include branding and campaign development. Graduates with online marketing degrees find success working in roles in retail management, brand development, sales, and advertising. SNHU structures online courses in six eight-week terms per year. Distance learners access a new module at the start of each week, which may involve discussion, a short paper, a collaborative project, and several larger assignments with extended due dates. Support services for online students include the school's Writing Center, round-the-clock online tutoring, career counseling, a job database, academic advising, 24/7 tech support, and a resource center for disabled students. In addition, SNHU's online student union serves as a helpful source of information and collaboration on homework assignments. The program features multiple start dates each year. Unlike some online marketing programs, the application process for SNHU’s degree requires only an online undergraduate application (with no fee) and official transcripts. The university allows degree candidates to transfer in a maximum of 90 credits, and provides a 30% discount on tuition for active-duty military members and their spouses. Otherwise, all distance learners pay the same rates, regardless of their state of residency. Delivering online courses since 1998, Saint Leo was the first Catholic college in Florida (and among the first colleges in the country) to offer distance education. The school's BA in business administration with a marketing specialization equips students with the analytical tools required to respond to complex business challenges. Additionally, this online degree in marketing incorporates training in general business practices and principles as well as leadership skills. Degree candidates complete 36 credits in core knowledge courses (such as applied decision methods for business), 12 credits in foundation courses (including writing, math, and computer skills), 24 credits in the marketing specialization (such as essential business skills), and 18 elective credits. Saint Leo's Starting Point, a series of self-paced, online tutorials, can help newly admitted students prepare for online classes and familiarize themselves with the university's resources, such as the library and its 290,000 e-books. Saint Leo delivers entirely online courses using audio and visual content, CD-ROMs, and textbooks. Distance learners benefit from 24/7 technical support and online tutoring, book delivery, and interlibrary loans. Assigned student advisers help students over the phone or email to build a personalized course schedule and resolve academic concerns. Career services include online cover letter and resume-building modules, interview preparation, career assessment tools, internship resources, and information on graduate schools. Saint Leo accepts distance learners to the program on a rolling basis, with six convenient start times each year. Prospective students should submit transcripts, relevant standardized test scores, a $45 nonrefundable fee, and any training documentation with their online application. Graduates of more than 40 partner community colleges may be able to transfer credit directly to Saint Leo. Those with an associate of arts degree may transfer up to 64 credits. The university evaluates the transferability of credit from other programs toward the digital marketing degree online on a case-by-case basis. Founded in 1866, Davenport University is a private nonprofit school that enrolls 7,500 students annually in its 50 on-campus and online academic programs, including the online bachelor of business administration in marketing. Designed with the valuable input of business partners and expert marketers, the DU curriculum synthesizes theoretical concepts with hands-on skill development. Students learn to identify market trends and consumer behavior to create sustainable, ethical brand movements that connect with buyers. Degree candidates can earn their BBAM entirely online or through a hybrid delivery method, integrating flexible weeknight and weekend classes on the Grand Rapids, MI campus. The 120 credit degree plan includes coursework in areas like corporate finance, strategic marketing, and professional selling. Students must also complete a business field experience or marketing internship, which are facilitated through the department and let students gain work experience and build professional relationships. In addition to conventional degree requirements, students can also specialize in a sub-field such as value chain, marketing technology, or digital marketing and promotion. Students may also pursue professional certification in these specialization areas. Davenport charges the same tuition rate for all online students, and financial aid opportunities are available such as foundation and institutional scholarships. Distance learners can transfer up to 90 credits from another regionally accredited college or university to further lower the cost of their degree. Academic and professional resources are available, as well, such as online tutoring services, career assistance, and the opportunity for experiential learning through service/volunteer projects and study abroad trips. A pioneer of distance learning located in Alabama, Troy features more than 40 online degrees. The school delivers its bachelor's of science in business administration in global business with a concentration in marketing in a blended format that combines online content with in-person instruction. Troy's online marketing degree attracts those who are pursuing marketing careers in government, business, the U.S. armed forces, and nonprofit groups in the U.S. and abroad. The program leads to job opportunities in marketing management, marketing research, retail management, entrepreneurship, and promotion management. The curriculum pulls from a range of disciplines, focusing on new product development, promotional strategies, distribution, and pricing. Degree candidates complete 18 hours of required courses like services marketing and consumer behavior, in addition to electives like personal selling, advertising, and supply chain management. Seasoned instructors bring added value to the classes they teach with first-hand perspectives and industry experience, focusing not only on theory but also on real-world application. Distance learners pursuing their marketing degree online participate in activities and collaborate with peers using the Blackboard LMS. Students new to online learning can prep for the program's format through a free introductory online course. The program features various study options for part- and full-time students, delivering traditional classes during the day, classes in the evenings and on weekends, and online courses. Most courses last for nine weeks. Troy offers discounted tuition for military members and for full-time employees at more than 75 local community businesses, municipalities, and organizations. Transfer students can take advantage of the school's unofficial transfer equivalency report to determine how many undergraduate course credits they can transfer. Applicants pursuing unconditional admission need at least a 2.0 GPA, along with specific minimum composite scores on the ACT and SAT exams. Troy uses less stringent requirements for conditional admission. Founded in 1851 as a two-year women’s college, Columbia College is now a four-year coeducational institution that serves 29,000 students across 35 campus locations and online. The bachelor of arts and bachelor of science in business administration with a major in marketing is one of 29 online degrees offered by Columbia. Students in the program develop the cooperative work, strategic management, and market/consumer research skills to create effective brand campaigns. Graduates of CC’s online marketing degree find careers in a variety of sectors, including nonprofit organizations, multinational corporations, government agencies, or work for themselves as entrepreneurs. Students can earn their degree fully online or add campus-based classes to create a hybrid experience. Both the BS and BA degree plans total 120 credits and include major coursework like business information systems and marketing. Students can personalize the curriculum with electives, choosing advanced topics like retail management, sports marketing, or international advertising. They may also pursue an internship with the help of a faculty advisor and site supervisor. Students complete this experience during their junior or senior year as a way to apply learned skills and network with marketing professionals and potential employers. Degree candidates can access additional professional support through the Fishman Center for Entrepreneurship, which helps students locate internships and career opportunities, and provides mentoring and start-up capital for those who want to build their own enterprise. Columbia does not require a minimum GPA or standardized test scores to gain admission. Tuition rates are affordable and financial aid is available to all distance learners. Most online marketing bachelor's degree programs prepare students for entry-level management positions in private firms or nonprofit organizations, but there are differences between programs, including the general curriculum and concentrations offered. This guide provides a starting point as you look for the program that best suits your interests and career goals. In order to meet industry standards, most online marketing degrees have a core curriculum that builds a knowledge for more advanced and specialized courses. The curriculum may differ depending on a program's specific mission and what its faculty consider important for future marketing professionals. Below is a sample curriculum of what students can generally expect. Management & Leadership Perspectives: A prerequisite for many graduate-level programs in marketing and business, this course teaches students the strategies and theories behind how effective team leaders function. Students also learn the differences between management and leadership, and how to combine the two into a model that best suits their personality and specific field of work, preparing them for careers as sales managers, marketing managers, and more. Consumer Behavior: This fundamental course is found in most online marketing degree curricula. The course teaches students the basic processes and psychology of buyer behavior, ranging from external influences like culture and family to internal factors like personality and social perceptions. This course prepares students for all forms of work in the field. Information Technology for Marketers: Also called E-marketing, this course teaches students fundamental concepts of online communication as it relates to marketing practices. Students also learn to use hardware, software, and databases to interpret consumer trends and make decisions relating to marketing strategies and overall commerce, enabling them function as brand managers and social media specialists. HOW LONG DOES IT TAKE TO GET AN ONLINE BACHELOR'S IN MARKETING? All online marketing programs require students to complete 120 hours or more of college-level work in order to earn their degree. Some schools offer a fully-online undergraduate degree track, enabling students to complete their entire bachelor's remotely in four years. Most online marketing programs structure the degree plan as a two-year completion pathway, allowing students to transfer a least half of the overall credit requirement, usually in the form of general education classes from community colleges or another university. The nature of an undergraduate marketing degree does not require a lot of cohort-based learning. Most coursework is done at an individual pace, usually asynchronously, with designated requirements for classroom discussion through online message boards. You should always discuss your academic needs and schedule an appointment with a school's academic advisor before applying to a program. Nationally accredited schools meet the overall standards of higher education established by the United States Department of Education and the Council of Higher Education Accreditation. Regional accreditation comes from a number of organizations that oversee specific standards of that part of the country. The Higher Learning Commission is the regional accreditation body for the central United States, including all the midwestern states. Regional accreditation is more important, since business and companies operate heavily under the auspices of state governance. The best online marketing degree programs have national, regional, and industry-specific accreditation. For a marketing degree, it's also important for students to pick a school that has the stamp of approval from either the Accreditation Council for Business Schools and Programs (ACBSP) or the Association to Advance Collegiate Schools for Business (AACSB). Almost all accredited not-for-profit colleges and universities seek national recognition from the United States Department of Education (DOE), a government program that oversees national standards of higher education, and the Council of Higher Education Accreditation (CHEA), a non-government body that seeks to ensure the same academic quality. Both of these organizations also maintain the standards for regional accreditation. For a list of nationally accredited institutions, go to the DOE's and CHEA's websites. According to a 2014 survey by Georgetown University's Center on Education and the Workforce (CEW), the job outlook for marketing and marketing research professionals is steadily improving. In 2009-10, marketing degree-holders with work experience faced an unemployment rate of 6.0%, while inexperienced college graduates with degrees in the same field faced a 7.3% unemployment rate. Two years later, these rates had fallen to 4.3% and 5.6%, respectively. Using the most recent survey data available, the following table weighs employment prospects for marketing majors against degree-holders in other business-oriented fields. As the table shows, the unemployment rates for experienced and inexperienced marketing degree-holders are substantially lower than the rates for other business majors. As noted in U.S. News & World Report, however, job placement in the marketing industry varies by specific career paths. Marketing managers and sales managers, for example, currently face an unemployment rate of 3.5%, while sales representatives face an unemployment rate of 4.2%. Since a bachelor's degree is generally considered the educational minimum for marketing professionals, college students who complete an undergraduate marketing program stand to earn more on an annual basis than their counterparts with lower credentials. The table below compares earning expectations for bachelor's and associate degree-holding marketers at two key career stages. According to the data table, marketing professionals with a bachelor's degree outearned their colleagues with an associate degree by 32.2% at the entry-level mark and a staggering 79.7% after 10 years in the workforce. However, it's important to note that individual salaries for marketers will vary by specific careers, as well as other factors like degree specializations, city/state of employment, and company size. The next table looks at salary expectations for five different professions related to marketing and advertising. The average career salary growth for all five careers listed on the table above is 42.1%. Social media managers recorded the highest rate of growth, 58.6% between the entry-level and late-career benchmarks. Market research analysts placed in a close second; their earnings increase roughly 50% after more than 20 years on the job. Students who graduate with a bachelor's degree in marketing will qualify for dozens of entry- and mid-level jobs, as well as managerial positions normally reserved for candidates who have received a college education. Four of the most common career pathways for marketing bachelor's degree recipients are detailed below. Advertising, Promotions, and Marketing Managers: These managers oversee various campaigns designed to promote specific goods and services for consumers. A given campaign may include promotional giveaways, consumer surveys and billboards, banners, and other advertisements in print, digital, and web-based media. The nature of their profession requires them to regularly collaborate with graphic artists and designers, sales representatives, finance personnel, and members of other departments. Market Research Analysts: These professionals are responsible for the meticulous research and analysis that go into marketing campaigns. Factors to consider include sales trends, competitor rates, market activity, and various consumer metrics related to age, region of residence, and socioeconomic background. Once they have collected sufficient data, research analysts usually present their findings using written reports, data tables, and graphs. Sales Managers: Sales managers lead teams of sales personnel at private companies, nonprofits, and other large organizations. They create sales objectives for their teams, review data to ensure organizational goals are met, and design trainings and other professional development opportunities for employees. Advertising Sales Agents: These professionals occupy a specific niche in 21st century marketing: the sales and acquisition of advertising space, primarily on the Internet. They work to identify potential investors, and then deliver cost-benefit estimates in order to complete a successful sale. Although the declining newspaper industry has led to a small dip in jobs for advertising sales agents in the newspaper industry, the Bureau of Labor Statistics (BLS) projects a more favorable growth rate for positions in web media. Many marketing bachelor's degree recipients choose to continue their education with an MBA program. For more information on this option, please visit our Online MBA Guide. Making professional connections and learning about different approaches to marketing is crucial to your success. Professional organizations offer a great entry point for students who want to learn more about their chosen career path. Below you'll find three of the country's most prominent organizations established for marketing professionals. These organizations host networking events, provide online trainings, maintain active job boards, and offer other services for career-ready college graduates. American Marketing Association: Founded in 1953 by business pioneer Neil Borden, the AMA is dedicated to providing advocacy and professional development for members of the marketing industry. The association's website is a compendium of information, with an extensive amount of resources on branding, engagement, consumer metrics, and other areas of marketing. Society for Marketing Professionals: The SMPS represents more than 6,000 marketing professionals in the U.S., and draws support from roughly 3,500 firms nationwide. Members receive invitations to networking events, a complimentary journal subscription, career leads, and unlimited access to the society's online marketing center. Search Engine Marketing Professional Organization: First launched in 2002, SEMPO is a nonprofit dedicated to the niche industry of SEO marketing. The organization hosts a wide range of online and brick-and-mortar events throughout the year.